I wrote earlier how in many ways the impact of IoT is being underestimated. Yet more and more you are seeing opinions that perhaps IoT is in reality overhyped and growth is stalling. Does the lack of standards or growing security concerns mean that IoT may just not meet many of these grandiose expectations? Or, to borrow terms from the Gartner Hype Cycle for emerging technologies report, are we moving towards the natural evolution of technology, past the peak of inflated expectations, and diving right into the trough of disillusionment? Are we waiting for the slope of enlightenment to hit where everyone goes back to having those IoT ah ha! moments? I agree that with any new technology the initial hype often doesn’t match the substance behind it. As I have said before, I believe much of the initial hype was misplaced. It was myopically focused on devices and failed to consider the interaction between devices, data and applications and how we integrate all of these devices and systems together. While I just stated that there was too much hype on devices, it will be the devices that really drive IoT forward. How can that be, isn’t that a contradictory statement? Not really. The growth in the number of devices combined with the introduction of new device form factors will serve as a forcing function for organizations to improve how they manage the data flow between devices and applications. The whole notion of how we define an application will change — moving away from a model where information is presented to a user from a cloud system or a back-end system, towards one defined by the interaction of data, devices, apps and users. And this is not just my opinion, this belief is backed by the law! More specifically, Moore’s Law and Metcalf’s Law. 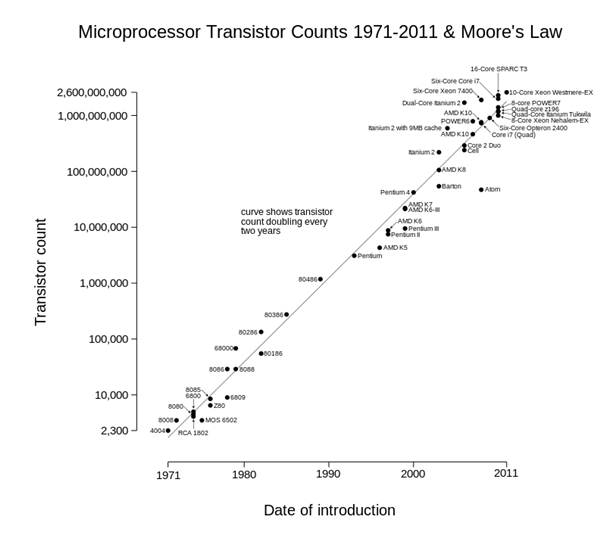 I’m sure most people know what Moore’s Law is, it states that the number of transistors in a dense integrated circuit doubles approximately every two years. Moore’s Law is basically saying that on a regular basis, devices are getting more powerful, smaller and cheaper because the brains within the devices are getting smaller, more powerful and cheaper. I think anyone old enough to remember what a PC looked like 30 years ago compared to what a smartphone is capable of today understands that analogy. It is pretty amazing to me that this law postulated in 1965 is still in effect today, although many predict we are fast approaching the end of Moore’s Law (we will get to that later). This law is easy enough to understand, however I don’t think most people appreciate just how revolutionary the impact of Moore’s Law has been. In the Wikipedia definition of Moore’s Law, it presents this graph, depicting the early days of Moore’s Law to recent history. What this graph illustrates is the amazing consistency of Moore’s Law, which for the most part has stayed true to the original cadence predicted all of those decades ago. However, this graph doesn’t show the true exponential growth curve of the law. Instead it presents the growth on a logarithmic vertical scale, which makes it easier to show all of the data points. If you were to look at the same growth on an exponential scale, starting in 1971 and culminating in 2011 (where the above chart ends), you would end up with something that looks more like the chart below. Take note of how much of the growth has occurred in the last ten years of the chart. The data is the same as the Wikipedia chart, it is just expresses the growth exponentially. Now the end of Moore’s Law is something of much debate. Some forecasts have it hitting its peak in 2021. 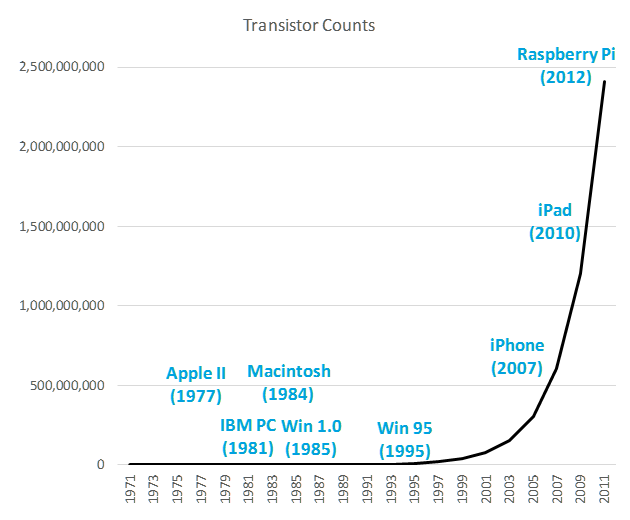 It’s not to say that innovation won’t continue, we just won’t necessarily be beholden to the rule that transistor capacity will continue to grow at the same rate it has for the previous 50 years. But what if it does continue at the same growth, at least for a few more years? What happens to our chart above if we extend the timeline from 2011 to 2021? I have plotted that growth below, following the same exponential growth curve. In the updated chart, you can see that the 2011 spot on the curve is pushed towards the bottom with tremendous growth in processing power just from 2011 to 2016. Has that growth held? There have been chips announced this year with over 12 billion transistors, so the answer so far is yes. If we continue Moore’s Law from 2016 to 2021 on the same growth curve, we will see more growth in processing power in the next 5 years than we saw in the previous 45 years. This leaves plenty of room for innovation in the coming years. 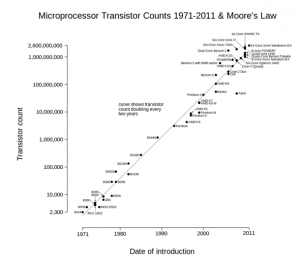 How does IoT relate to Moore’s Law? With the growth of processing power, is there a direct impact on the growth of IoT devices? Some indicators from recent years point us towards the answer — yes. In 2015, 97 million wearable devices were in use and 604 million M2M connections were made. As the guts of computing devices have become more powerful, the flexibility to create different, cheaper and more pervasive devices with form factors for new and interesting use cases has and is happening. 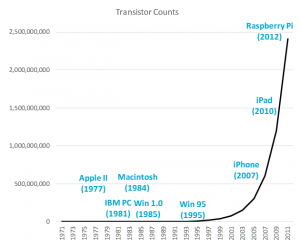 With Moore’s Law leading to all kinds of devices in use, what is the impact of all of these devices? Let’s measure that impact in terms of another law: Metcalfe’s Law. For those not familiar with Metcalfe’s Law, it states that the value of a telecommunications network is proportional to the square of the number of connected users to a system. For example, if you only have two phones in a network, you can only make one connection. If you have 5 phones, you can make 10 connections. If you have 12 phones, you can make 66 connections (something this image illustrates). As you add more users/devices, the number of connections continues to scale out. This law came about in 1993, in the somewhat early days of cellular networks. This law has evolved as the internet has evolved, with recent examples illustrating how Metcalfe’s Law can help establish the value of social networks — the more users using a social network, the better the experience becomes for everyone using that network. How does IoT relate to Metcalfe’s Law? The impact relates back to the previous discussion with Moore’s Law leading to new kinds of devices, form factors and use cases. Many of the previous examples for Metcalfe’s Law focused on the connections between the users attached to a device on a network. With IoT, networks contain not just devices associated with a user, but also devices associated with other devices. This brings up new ways to derive value from the network. The more interactions I have with data, devices and apps within my personal network, the more value I can derive from the context captured by those interactions. A business can then capture more inherent value from the data generated from these interactions by casting a wider data net. The value of big data and analytics in an IoT-influenced network comes from mining these interactions for information that improves an organization’s security posture, helps them make more informed decisions regarding their customer’s behaviors, or helps make their business more effective and efficient. Moore’s Law and Metcalfe’s Law planted the seeds for the internet of things decades ago, illustrating and helping to predict potential for IoT. These laws do more than simply set the stage for the billions of devices coming with IoT, they also set the stage for digital transformation in general. This brings us back full circle to my earlier notion that the definition of an application is changing. Applications will be increasingly defined by the interactions we just described. In essence, Moore’s Law and Metcalfe’s Law directly impact how we think of devices, applications and networks, and also directly impact how digital transformation will transform the enterprise. Perhaps it is time then for a new law, the Law of Digital Workspaces? For this law I postulate that business user productivity within a digital workspace is driven by the number of devices, sensors, things and apps that user is connected to. What do you think? Share your comments below. Minority Report, here we come! I agree that we should develop Digital Workspace to make our business easier and more comfortable. It may be driven not only by the number of devices but business mindfulness of employees.